The Willesden took on the WesterlyCC earlier this month and not a bike or a bonk bar was to be seen. This was a locking of minds rather than muscle and took the form of the Annual Westerly Quiz night. The Willesden fielded three teams and were clearly in a mood to reconcile for the thrashing we received last year. But more important than that, there was chocolate to be won! The quiz rounds were imaginative and teasingly difficult, just what you want from a quiz. 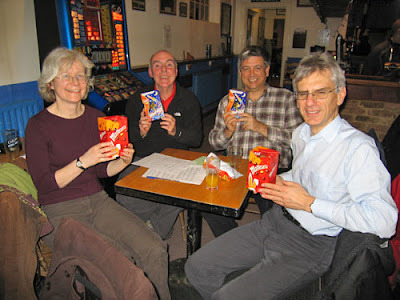 At the end of the evening the team of Vyv Baker, Ian Oliver, Ray Kelly and John Davies snatched the lead and then the chocolate. Second place also went to a Willesden team, whilst the Westerly took the last podium place. A great night out , superbly hosted by our friends at the Westerly CC. Thank you guys.